After our one hour sunbathing we follow the route from The Hague to Zandvoort on to Haarlem which was closer than we thought. On our way we not only saw a water castle but also water buffalos (what ever they were doing there). 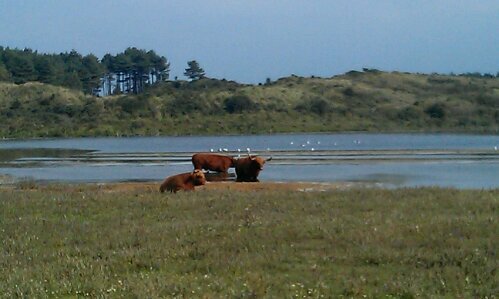 It was a bit confusing to see these creatures standing next to a small lake in the dune landscape in the Netherlands just as if they had always been there (which I very much doubt. As far as I know they are not originally from there, but please correct me if I’m wrong). And after a little round trip (google maps wasn’t too precise) we found our home for the night. And again we could have accomendated two more people. 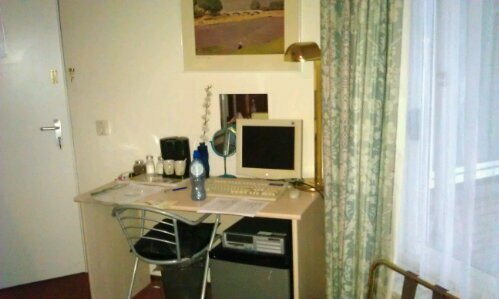 The room was very special, right from the early nineties, I’d say, coming with an old computer, black leather sofa and everything. We had a look around lovely Haarlem before a quick dinner and right at 8 p.m. we were back at our lovely room (surely there was more to see but to be honest 58km are quite a way if you are usually only taking your bike for the ten minutes ride to work). Now we’ll sleep early again, so we are ready to make our way to Amsterdam tomorrow morning. 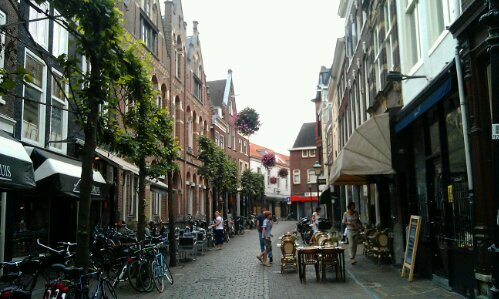 This entry was posted in In Europe and tagged Bike, Haarlem, Short Trip, Summer by kathatravelling. Bookmark the permalink.